I would like to make a case for all of my router bits. Can you drill a perfect hole in this type of foam? I can, or you can. Here's a few more, if anyone is interested in the speeds and how to do it. Hey Peter, Very nice work and thanks for sharing. I just read some of the posts and saw your response to Matthew and I wanted to know if you would be willing to walk me through that process with face time however I have never used face time but I am interested to learn. I also appreciate your willingness to help. I am curious on the process for taking the picture of the item and scaling as well as how to get different depths and logo marking on the foam or if you have an instructional video. That would be great as well. Im happy to show how i scale things, it will work for other items, not just guns. Do you have Adobe Illustrator? I have inkscape which I am using on an iMac. I am looking into AI but at this point I am not sure it is needed. Let me know what time works for you. I have all morning available today. PS: I am on the west coast, so we are PST. I will be avalibe in 2 hours. Wanna call me here at the office 828-357-8596, and we can get each others facetime or skype or go to meeting. That works perfect for me. I will give you a cal. I have skype and facetime, however I have not used facetime before, so let's try that. If that doesn't work then we can switch to skype or google hangouts, which I have had great luck with. Talk to you in a few. I got some of my best upcoming work in process right now. Ill post it when i got it finished. Peter, thanks for the other day. You were a great help. I got my bit in on Friday, loaded it up, turned on the machine and the bit broke in half before I could even touch anything. So needless to say I am waiting on a new one from the mfg. However I just wanted to let you know how much I appreciate you spending time with me the other day. Great people like you are what makes these forums worth reading. Ive seen your work on here before, great stuff. Oneday I'd like to attempt this idea and make a custom case for my PLR-16. Now make some cool stuff! I know it's been a bit, but I'm just getting free of my backlog and want to cut some foam, are you still offering the discount?? thanks! Peter Wakem is legit his foam is awesome I was surprised to see how well it machines and how tough it actually is. Peter also went out of his way to help me carve a 1911 profile in his foam for a concealment shelf, he saved me hours of frustration and was happy to share his expertise. If you need foam for any kind of case Peter and Carolina custom foam is the place . 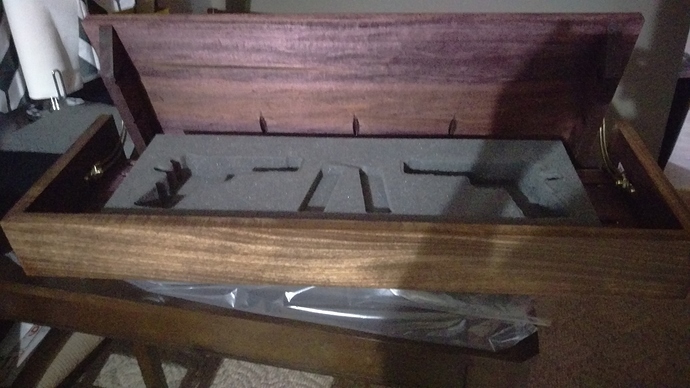 I recently had a customer request custom milled foam case inserts. I ordered the foam I needed from your site a few moments ago. Im very excited to give it a shot, any suggestions on feed speeds etc.? I appreciate the help! on the order you got the 1 inch, you will have no choice but to cut all the way through. If you have more room for a deeper cut, i would suggest going with a 2 inch, so you can cut to depth. I would go with a thicker bit. The smallest i use is a .25 double blade straight cut. you can push the bit all the way into the depth of the cutting area of the bit. MAke sure that foam is held in place, if it shifts or gets pushed, thats all she wrote. VACUUM VACUUM VACUUM! the foam will got freaking everywhere. It really likes to build up on the rails and increase the size of your wheels, and then next thing you know, your cutting in timbuckto. ,ake sure you get all those little flying pices of foam. Run it raster, conventional cutting with a last pass. and i do a 1 inch ramp in. LEt me know if you need any more help. If you have a .ai of what you want to cut ill turn it into a gcode for you. if you you only have easel.